Japan is a modern country as well as a traditional country, it is a major industrial country that ranks the No. 2 economy great power in the world, it has created a economy miracle with a very high degree of modernization in a small land whose area is as small as one of provinces in China. Skyscrapers and modern fashion designs in Tokyo's all make you dazzling, those high-tech products also very well-developed, while their eating, living, and daily use articles still remained very traditional, especially in Kyoto, there are very few high-rise buildings, most of buildings there are traditional low-rise residential, and inside living space there are tatamis, people used to sitting and sleeping on the floor, which is kind of very traditional way of life. Rooms in Japan are mostly constituted with logs, white walls, papers and wood lattice sliding doors, which reflects a collateral system of tradition and modern, with the passage of time, the modern become integrated well with traditions, and Oriental aesthetics features will usually be added in modern designs. Nordic think design is an integral part of their lives, Americans keep it as a money-making tool, while Japanese believe that design is a means of national survival. After the war Japan was occupied by U.S. troops, on whose land they have to build barracks, homes, offices and various service facilities for themselves. As the U.S. military could not suited the Japanese way of life, they build American-style homes and furnishings according to American patterns and practices, and check and accept them according to American standards too, so the level of design skill in Japan raised rapidly and has attained to a top grade in the world. 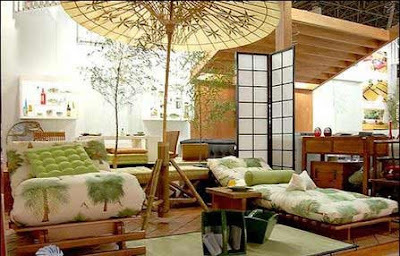 At the beginning of the 60s, Japan began to establish specialties of interior design and furniture design. With professional design teams, they also set specialized subjects of interior design and furniture design in their higher education system. During times of post-war, Japan put a high premium on both technical quality and talent development, which has built a solid foundation for its rapid development in future.